Last Thursday during the day both the editor and I worked in the big smoke of Melbourne. The evening was warm for this time of year and the sky was clear. As we were already in the big smoke, we headed out to our favourite stomping grounds of the inner northern suburbs of Carlton and Collingwood and walked to various spots where we enjoyed a well-deserved coffee and much later a delightful Po’ boy dinner of 12 hour slow cooked pork in a tasty spicy gravy over a bed of chips (fries). The great thing about being winter down here is that only the true die-hards can sit outside on the street at the tables provided by restaurants and consume their meals. Most people in Melbourne consider the winter weather to be too cold for their comfort to sit outside at night and so they seek the warmer spaces inside the restaurants. As the editor and I have acclimatised to a much colder environment up here in Hillbilly country, Melbourne feels positively toasty to us! So we sat outside on the street and enjoyed our most excellent food and watched the spectacle of the human condition pass us by. The inner northern suburbs of Melbourne can be a real mixed bag. The food is usually very good and affordable. The hipsters mix with the high stress folk who have come down for the secret thrill of eating out with the commoners. The young are heading out to wine bars and pubs with their friends. One cheeky bar even advertised itself as being the perfect place to take your failed tinder date (whatever that meant)! And amongst all of those people, the beggars, homeless and what appears to me to be junkies all cruise up and down the long streets trying to score a buck or two. As I said, it is a real mixed bag of people. We live in the forest, and it is a quiet life by all accounts, but we always remember to not forget the social currents of the big smoke, and so we regularly immerse ourselves in them. And at the same time we can enjoy some good coffee and even better food. So on the long walk back through the streets which are filled with the old Victorian era housing, which have so much character and charm, I happened to look up into the clear night sky in between the neat rows of those historic houses. And I marvelled at what I saw there. I could only count about a dozen stars in the entire clear night sky. It was quite the shock to my senses, as for years if I was to walk outside at night up here in cold Hillbilly country, I could see the stream of light that is the Milky Way and the sky is full of stars. Yet, in Melbourne those stars were much diminished and less than a dozen were visible. One of the benefits of having a night time sky full of stars is that you quickly realise that there are a lot of shooting stars. Shooting stars, is really the fanciful name for rocks and other space junk falling through the atmosphere towards the Earth’s surface. Woosh, a small bright light quickly speeds randomly across the night time sky before completely disappearing. Some are much faster than others as if they were somehow in a hurry to burn themselves up completely in the friction generated by the dense atmosphere of the planet. I doubt very much that shooting stars are even visible in Melbourne. Winter always produces the clearest night skies here. Some nights I stare up into the sky hoping to catch a glimpse of one of those shooting stars. In the old days people used to say that spotting a shooting star would bring the viewer good luck. In today’s more enlightened times I certainly don’t believe such superstitious nonsense, well maybe I don’t… Whatever! The problem is that shooting stars skip to their own dance and they rarely appear when convenient. Some nights are full of shooting stars whilst other nights they will be elsewhere and nary a one will be seen. Energy from the sun is a lot like a shooting star. It can be intermittent and unpredictable. 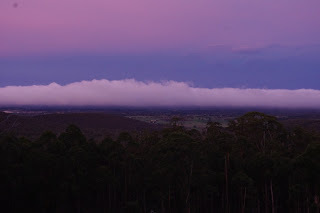 Some seasons, the sun supplies too much energy down here, whilst at other times of the year, the sun can be low in the sky and the clouds and mist can move in and it can feel as if the sun is elsewhere. Winter is rapidly closing in on the farm and the sun is getting lower in the sky and some days you can’t even feel its slight warmth. Some mornings you can awake to find that the cold air has dropped from these mountain heights overnight and has settled in the valley below. 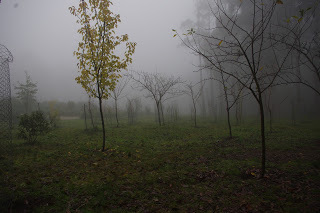 Sometimes clouds blanket the mountain range here and the orchard looks very eerie in its winter nakedness and the humidity rises to 99%. Long term readers will recall that the house is supplied with electricity entirely from 4.2kW of photo-voltaic (PV) solar panels. At this latitude of 37.5’S, there is generally enough electricity generation to supply on average at least one full hour of strong sunlight on average per day. What that means in practice is that on average, I can rely on 4.2kWh per day for about 3 weeks either side of the winter solstice (June 21st 2016) from the 4.2kW of installed solar PV panels. That isn’t a large amount of electricity per day, but with a bit of care, living in comfort with that limitation is very achievable. In fact, most people who visit the house at this time of year really wouldn’t notice the minimal use of electricity. An unusual feature of photo-voltaic panels is that over a very long period of time the glass understandably abrades in the weather and the output slowly drops. 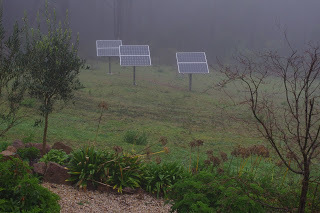 With that concern in mind, I added an additional two x 200W PV solar panels to the system this week. Observant readers will note that the trench for the electric cable revealed the most beautiful chocolate brown volcanic loam. 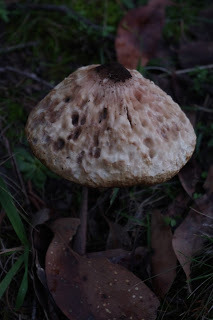 The soil was absolutely full of witchetty grubs blinking in the unfamiliar light of that day. 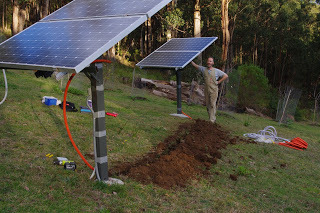 Most of those grubs were reburied in the cable trench. The local birds on the other hand were not shy about cashing in on an opportunity and the Kookaburra’s and Magpies have taken to using the solar panels as a grub look-out spot! This week the new concrete stairs gained another step before the very wet weather moved in and put an end to that project. 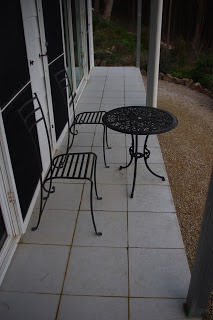 Concrete will still cure in the cold winter conditions here, however the very real problem is that the rain can pock mark an otherwise smooth concrete surface. Sometimes, I’m completely unaware that I should be considering a project or system on the farm. At other times, I’m aware that the system is not working as well as it could be and don’t yet have either the ideas or resources to deal with the problem. But at rare times, conditions change for some other reason and I begin to consider the problems that have arisen. For years, we have been making yoghurt. Before that time, I used to purchase tubs of yoghurt which were inevitably sweet and very tasty. I stopped purchasing the tubs of yoghurt because they started becoming ever more expensive. Thus began our journey of the getting of culture and making yoghurt from culture sachets. It is a very simple process that just involves a few basic ingredients, time and heat. Recently the cost of the culture sachets increased and we started wondering about making yoghurt using even more basic materials. That is when we made the horrific discovery that 97% of the culture sachets were comprised of milk powder. Oh the horror of discovering that we had been paying good dollars for many years on a product that was mostly milk powder! 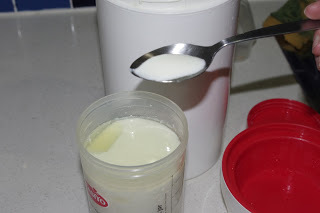 The sachets produced 4kg (8.8 pounds) of yoghurt for about $5. Something had to be done to avert this dastardly situation! So we researched how yoghurt is made and then bought a bulk supply of culture which was enough to produce 100kg (220 pounds) of yoghurt for about $15. This week we produced our first 1kg (2.2 pounds) batch of yoghurt. That’s winning, that is! 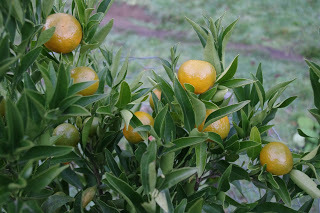 With the now colder winter weather, the citrus has really started to ripen on the fruit trees this week. Most mornings we are enjoying fresh limes, mandarins and grapefruit. 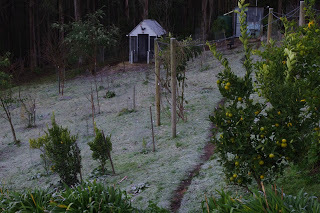 Not to forget the many lemons which we will soon juice and then freeze for use over the next summer. 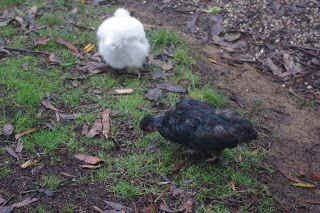 Tufty head is the chicken who was featured in last weeks blog as she had a late moult. She wants to send everyone a big thank you for their concerns over her rather un-ladylike appearance last week. Tufty head also wanted me to add an update this week to let all who were concerned at her plight know that she is now rapidly regrowing her feathers! The temperature outside now at about 9.00pm is 5.6’C (42.0’F). So far this year there has been 317.0mm (12.5 inches) which is up from last week’s total of 297.6mm (11.7 inches). Who were discarded as if they were rubbish. 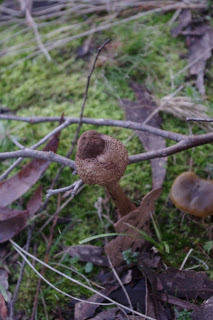 The recent one was Tasmanian Oak. It is a fun thing to be able see potential in discarded objects. And for connoisseurs with skill, we live in a truly target rich environment. I’m constantly amazed at the sheer quality of useful items that are discarded rather than being repaired or repurposed. And I began thinking about that matter this week as we were applying Tung Oil to the new second hand hardwood dining table that we purchased for $100. 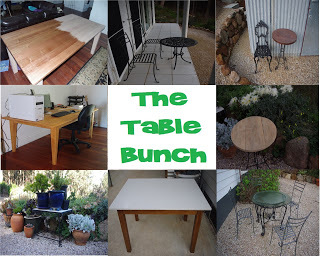 It was the editor that pointed out to me just how many tables we had purchased second hand and were now in daily use! The interesting thing about all of the restored and repaired tables here is that they all have their own story to tell. And it is an interesting collection of short stories which highlights the sheer waste going on all around us and also the sheer opportunity for those that are prepared to put in a bit of sweat equity. Waste on the scale of today is a fairly new experience for us. Way back in the early 1990’s when grunge and garage bands ruled the airways and the recession “that we had to have” raged on, the editor and I were both working in uncertain employment taking whatever jobs were available. We both studied at University at night and were desperately trying to pay off the student debts that we had been rapidly accruing. 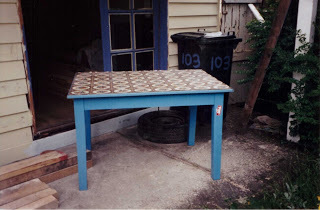 In those days we needed a table to study at and so we purchased this bright blue table which was clearly second hand for about $70. Observant readers with good eyesight, may be able to spot the pink velour couch just inside the door. That couch was pretty dodgy and some of the feet were even missing. Being the enterprising sorts that we are, we simply propped the couch on a few bricks and threw a sheet over it (which can also be seen in the photo). You may also notice the new timbers sitting on the concrete, as well as more timber inside the house which were being used to lift up the rear half of the house which had been slowly sinking into the clay and rotting. Now I’m not particularly partial to bright blue tables as they clash with, well, everything really. That table offended my sensibilities, but it was the best that we could acquire. I should also mention that the vinyl linoleum that the previous owners had thoughtfully tacked onto the surface was a nice touch, but it smelled really badly of a very old and very dirty kitchen, that may have been washed at least once in the past four decades. The linoleum had to go and soon, which was why the table was sitting outside in the photo. The vinyl linoleum was easily removed and discarded and it was then that we discovered that the table top had unfortunately warped – which was why it was covered over with linoleum in the first place. We could live with the warp far more easily than the stink from the linoleum, and so the table was sanded down to reveal that – we believe – the timber was very old and quite rare Australian teak wood. 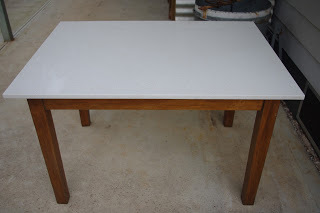 The table received many good coats of oil and was then used as a desk for the next two decades. 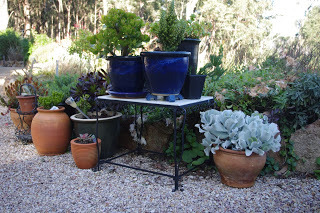 The old timber top from that bright blue table was such beautiful timber that we looked for a way to repurpose it. In such situations the local tip shop comes in handy and yet again they came through with the goodies! 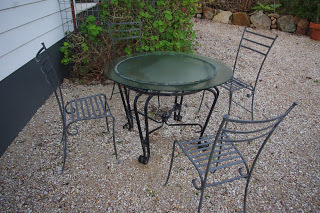 For $5 we picked up an old round steel garden table that had a very brittle wicker top. That wicker may have been brittle, but wow, what was left of it was hard to remove from the steel. In the end, we used a gas torch and simply burnt off the brittle wicker. Over the past week or so we cut a round section from the top of the old bright blue table and attached it to the steel new base. The timber was sanded back and then received lashings of Oil! A garden table for placing ones cider on, on warm summer evenings soon rose from the ashes of a dodgy wicker and steel table. That old bright blue desk had worked hard (like us) over the past two decades and it was previously used as our main work desk, but as the years went on we decided that perhaps it wasn’t a good look for our business. The editor went on the hunt to find a new table and in only a matter of weeks we tracked down a guy wanting to sell a solid, locally made, handcrafted, European beech table for only $80. We can help you with that problem, my friend! 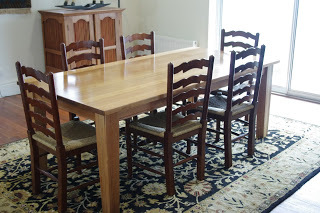 My gut feeling was that the table was sold at a ridiculously low price because down here the only time a person ever sees that particular timber is as a product of a very large Swedish conglomerate – and even then those items of furniture are usually veneers or vinyl wraps over chipboard. This one was the real deal as it was a solid hardwood and it bore the very respectable moniker of the craftsmen, who are still in business today. 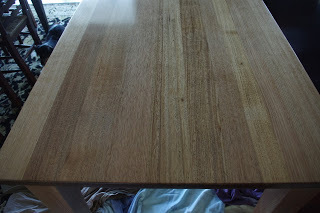 Again, the table received the Fernglade Farm treatment of a bit of sanding and some oil. 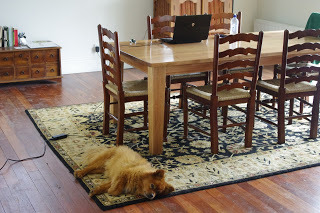 The editor was very wise as she purloined that European beech desk for her own purposes. At that time, I was using the previously bright blue table with its warped top. Clearly change was required in order to restore the balance of the household. 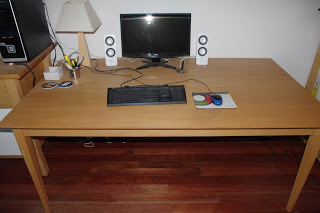 The editor as usual came to the rescue and tracked down a table made from Rubber hardwood scraps for $37. Rubber scrap is a great recycled timber because the tree scraps are generally burnt in the plantations at the end of their useful life. That Rubber tree hardwood table had been knocked around a bit and had many scratches, and so we sanded it back to the raw timber and then oiled it again. And this is the spot where I write and work for most of the year. Concerned readers may note that balance had been restored to the household. This week we began the slow process of applying multiple layers of Tung Oil to the new dining table. The new dining table replaces a much older Depression era (1930’s) table of about the same size which we have had for more than a decade. Unfortunately the veneer on the surface is beyond my skills to repair. Stress not readers! We will find a new home for the table, so all is not lost and it will be soon part of someone else’s story. The new table was spotted by the editor for sale at $100. It had been used and abused. Also someone in the past had painted it with an unfortunate coat of acrylic walnut stain, which I reckon looks pretty dodgy, but was probably par for the course at the time. 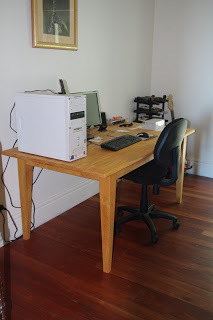 On a positive side the table was constructed locally in 1999 and was made from very solid Tasmanian Oak (the top is over 30mm thick (1.2 inches)) and showed no sign of any structural problems. Tasmanian Oak is a fancy name for a grab bag of local Eucalyptus species and a cynic may say that the “Oak” name was applied to lift the prestige of those local timber species. I believe the timber looks beautiful and has a very fine grain and also lots of features which you can see in the photo below (which was taken after five coats of glossy Tung Oil) such as fiddle-backing. 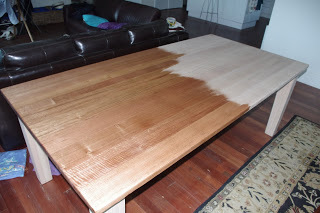 Of course sanding the walnut stain from all of the surfaces of that table was a huge job and applying Tung Oil to timber surfaces is a tricky and time consuming process. However, I have seen tables of such size but lesser quality timber in high end designer shops with asking prices in the thousands. It is mildly disturbing that such high quality older locally made items apparently have little market value. 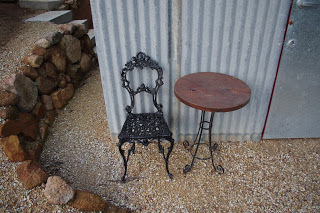 That’s not all though, the next photo shows a small cast iron table which was rescued (from the Lost Tables home!) and is used by the editor and I to enjoy a quiet coffee at the end of the working day. Incidentally, the steel chairs were locally handmade, and very solid steel items which we picked up second hand for about $40 per chair. They were made from very strange steel, because despite having been out in the weather for many years and in a black unpainted finish, they show absolutely no sign of rust and leave absolutely no marks. They are uncanny. A local timber craftsman who sells his wares at the local hippy market produces beautiful items of timber from recycled and otherwise wasted timbers. He produced a round table top made from Western Australian Jarrah timber for $50 to which we attached a steel base which we recovered from the tip shop for $5. The cast iron French Regency chair ($99 from a local ‘antique’ shop) in the photo below is a favourite of the editors and she always points them out when she sees them, but, well, I am embarrassed to admit that it is not to my taste. And then there was the 1950’s steel table base which had been recovered from hard rubbish in the inner city. Who throws these perfectly good things out? Best of all the off cut from the artificial stone benchtop when the original kitchen was being constructed fitted it perfectly. It was a match made in heaven! And then there was the Aegean 5000 overdrive table which the editor wanted so that we could enjoy coffee outside in the shade over high summer, but for some strange reason was painted a very unfortunate and culturally jarring gold colour ($80 with 4 unfortunately matching chairs – not the chairs in the photo, which are more of the handmade uncanny variety). I was very dubious of that colour but with a little bit of black metal paint, this glass table is the bizz! 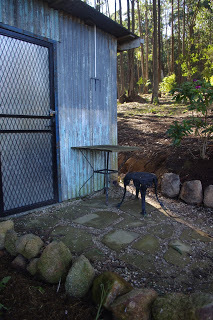 Finally, there is the old and very common Australian outdoor steel garden table which was rescued again from hard rubbish. Every single one of those tables that I have seen have had timber planks which were originally painted in multiple bright primary colours, but by now are rotted out or well on their way to doing so. 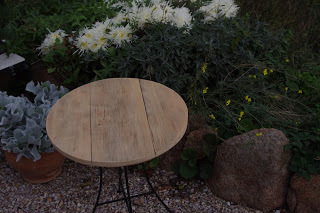 It was fortunate for that table that we had some very unusual and very old hardwood planks which simply refused to rot in the soil and so those planks were added to the table and all was soon good. If you ever receive a comment reply from me and I write that I am sitting in the orchard with the chickens, odds are this is where I will be. People often ask me how do we do so much and the above stories are part of that answer. But I ask you the question: How do you do so little on so much? That’s the way we became the Table Bunch. When the rain finally stopped the excavations continued and they are now almost complete and ready to be turned into garden beds. 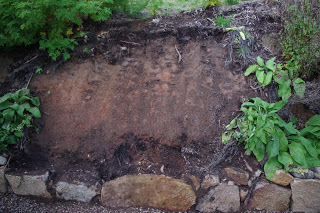 One of the garden beds had to be repaired as the shape was incorrect and manure kept falling off before the plants had a chance to get properly established. All of the plants in that bed were relocated to garden beds near to the chicken enclosure and the chickens were only too happy to assist with the pruning process. And believe it or not, we even managed to construct another concrete step! The temperature outside now at about 8.00pm is 5.8’C (42.4’F). So far this year there has been 350.8mm (13.8 inches) which is up from last week’s total of 317.0mm (12.5 inches). As I write this, I can look out the window and see, well, not much at all of anything, really! The clouds have dropped low over the farm bringing with them a thick mist which has hung around all day long. The wind is blowing strongly and outside is just wet. Winter is officially here! About 50mm (two inches) of rain has fallen this week over the farm and the water tanks are about 95% full as of today. All things considered it was a good week to become ill and spend a few quiet days asleep in front of the wood fire. And that is what I did! 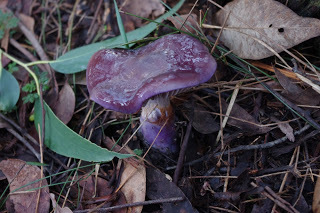 As I was feeling rather unwell earlier in the week, combined with the heavy rain, it was impossible to continue any of the larger outside projects that the readers of the blog have become accustomed to reading about. Instead, in this weeks blog we’ll remove the mystique and provide a warts and all account of all of the little things that go on in the background every single week which keeps this juggernaut of a story afloat! So without further ado, we shall take a sneak peek into the backrooms and quiet activity of life here. I’m not the only one at the farm who has spent their days asleep in front of the wood fire. Scritchy the boss dog has decided for herself that the weather is sub optimal for the usual outside activities of: patrolling the borders; harassing the other dogs; issuing instructions to the other dogs; and generally harassing the wildlife. 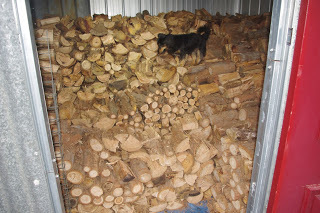 Instead Scritchy the boss dog this week was to be found in front of the wood heater, toasting her head. Scritchy’s other favourite sleeping spot is the old vinyl bean bag which is conveniently located close to the wood heater. That old bean bag is made from marine grade vinyl and it is over a decade old. Unfortunately for the bean bag, Scritchy is much like the princess in the story of the Princess and the Pea. That story is about a rather demanding and eccentric young lady who proved her princess credentials whilst at the same time earning the hand of a prince in marriage by complaining about a pea which was deliberately hidden (as a test) underneath 20 mattresses. Nice work! Now as an objective outsider to that Princess and the Pea story, I’d have to suggest that the young lady in question would probably be very hard work, and whilst I don’t generally provide advice to the readers of this blog, I would have to suggest that the young princess would make a poor choice for a partner, if on the first evening the young lady felt comfortable enough to commence complaining about the quality of bedding. If I was to put on my Agony Aunt hat, then I would also suggest that this complaint would be the first of many! Back to Scritchy and the beans. So every time Scritchy wants to sleep on the bean bag, she jumps up and prior to settling herself in for a solid sleep, the boss dog digs and scratches at the vinyl of the bean bag until it is just right. This technique of Scritchy’s can take quite a long time and it is slowly damaging the vinyl of the bean bag. A few weeks ago, the occasional bean escaped from the confines of the bean bag. Since then, it has rapidly became a rout and there are now beans everywhere. 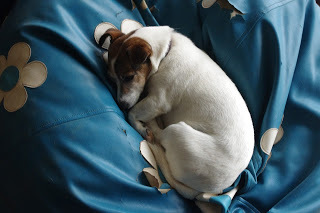 The editor came to the rescue this week and rather than disposing of Scritchy’s favourite bean bag, the editor sewed up a double layer internal bladder made from old painting drop cloths. 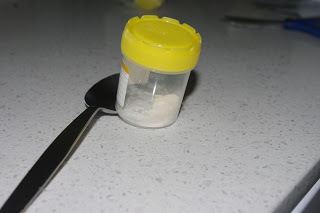 The bladder was then filled with the beans from the old bean bag and then that internal bladder was stuffed back into the old bean bag. There were smiles all around as we were no longer having to contend with escapee beans everywhere, and Scritchy could continue with her destructive tendencies. That isn’t the only place that Scritchy sleeps on cold winters days. The tiled hearth in front of the wood fire retains a huge amount of heat and that dog can toast both her stomach and her back all in one sitting! Store that cut and split firewood in an area that is not subject to rainfall and/or ambient moisture. Firewood is an excellent resource so if you are going to burn firewood to produce heat, you may as well use that heat for as many different purposes as possible. 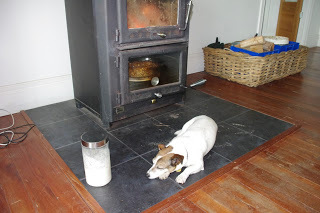 In the above photo, Scritchy the boss dog is enjoying the heat from the wood heater, however observant readers may also notice that there is a glass pyrex dish of muesli baking away in the oven as well. 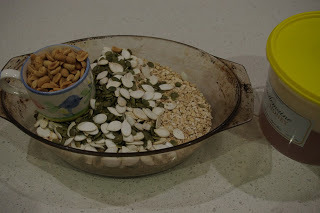 And just in case anyone has forgotten the recipe for this simple breakfast meal the next photo shows: rolled oats (4.5 cups); pumpkin seeds/pepitas (2 cups); roasted unsalted peanuts (1 cup); and some honey. The wood heater also provides heat to the entire household and the combustion chamber also has an 8kW wet back cast iron water jacket. 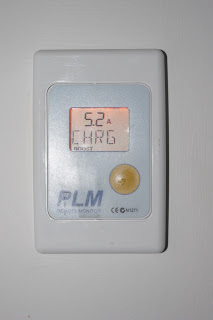 The water jacket keeps the hot water supply for the house toasty warm over winter when the solar hot water panels on the roof produce absolutely no heat at all. Then in the photo above of the wood heater there is also a mysterious glass jar with the metallic lid which Scritchy is keeping a close (yet apparently soundly asleep) eye upon. Inside that glass jar is a rather unappealing and very strange looking white substance which is a close match in colour to Scritchy’s hair. Alas, we had not considered the benefits of converting Scritchy’s excess hair into wine, although that is technically possible, but probably not very pleasant tasting. What is actually slowly bubbling and brewing away in that glass jar is our second attempt at making rice wine which is otherwise known as: Sake. Honestly, the contents of the jar sure look disgusting to me, but the contents smells like proper sake which has a slightly sweet and banana flavoured aroma. Despite feeling ill, the editor convinced me to assist with moving the newly sanded and oiled dining table into place this week. I reckon it looks pretty good and I challenge anyone to obtain a better table for the $100 we paid for that one. I actually enjoy extreme weather conditions such as this wet week because I can test many of the systems that are implemented here to see how they actually operate in the real world when conditions are less than optimal. 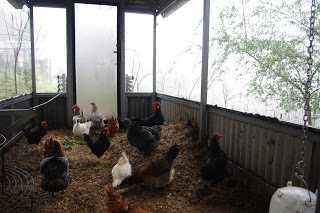 Despite receiving two inches of rainfall this week, the chickens who have been in their new housing for less than a year, still enjoy playing around in their dry and all weather run for most of each day. Last year at this time, the chickens would have been huddling out of the weather and looking very miserable in their hen house whilst in the previous chicken housing project. To the right hand side of that chicken enclosure, observant readers may spot a very leafy large shrub or small tree. That tree is a Tagasaste (or Tree Lucerne) and the leaves are great animal feed as they provide about 20% protein. 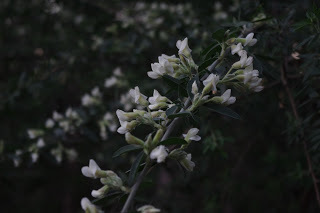 The tree is also one of the fastest growing trees here and it is a very drought and heat hardy. You can tell that the tree is clearly used to a tough environment as it produces flowers in the depths of winter. The local honeyeater birds have discovered this source of winter nectar and they love these trees. The cold and wet has just about finished off the tomatoes and I will soon clear out this bed by simply mowing and mulching the organic material flat to the ground. Once that has occurred we will then place woody mulch over the resulting mess. 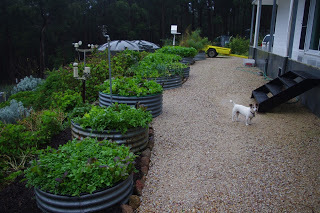 Over the next few months, we will then bring in more manure and plant the next seasons tomato crop which will be started from seed inside the house in late August. 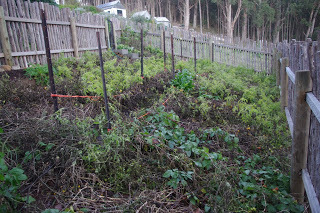 Next summer, we will also experiment with eggplant, capsicum and chilli plants in that tomato enclosure. It may also be worth mentioning that the dehydrated tomatoes stored in olive oil from last summer were a total success, but now almost totally consumed and we have been considering ways to increase the volume of that stored produce in future summers. The weather here can be confusing for the fruit trees. 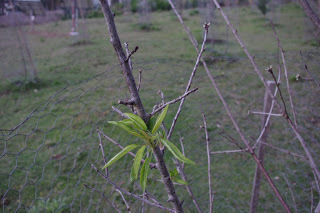 Almonds are one of the very first fruit trees to produce buds and leaves. It is still way too early to produce leaves and blossoms for next spring and I spotted this poor confused tree this week. 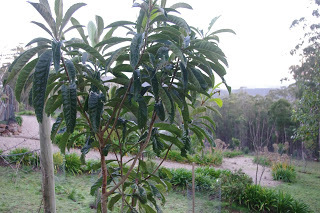 On the other hand, some fruit trees don’t even notice the winter conditions and this five year old loquat tree shrugs off the worst conditions that winter can throw at it. Loquat fruit is a tasty treat. Many years ago, I once owned a dog that consumed far more of that fruit than was good for her. The editor and I then took this greedy dog for a long walk. During the walk we stopped to watch a local real estate auction which was being held on the sidewalk. 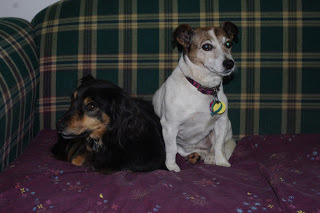 At an appropriately quiet moment during the tense auction, the greedy dog proceeded to vomit up the entire contents of her stomach which unfortunately smelled strongly of the tasty loquat fruit. 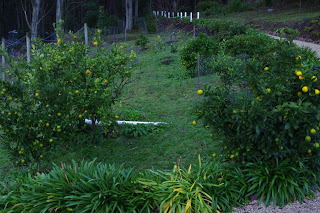 As winter deepens, the many citrus fruit trees also shrug off the worst of the winter conditions and produce ripe fruit. Home grown citrus is the only way to go as many citrus fruit on sale today has very little taste to me. Despite the occasional light frost, there are still many fresh greens to be picked every single day. It is hard to see in the photo below, but some of those raised garden beds are being cleared in readiness for replacement of the currently rusty steel rings which provide them with structure. As part of the purchase of the new steel raised garden beds, we will be assisting some friends with constructing a half rounded steel house for their two piggies! Regular readers will recall the production of soap many months ago. 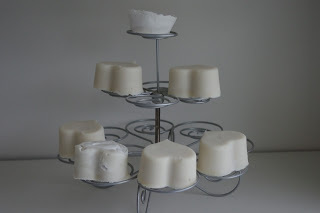 The soap has long since dried and became usable and it is now slowly curing to a white colour. Winter conditions are a total disaster for generating electricity from the solar photovoltaics and today the 4.6kW system produced about the equivalent of a very loud mouse fart! 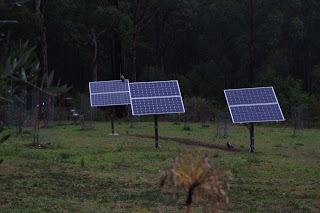 And at the time of the above photo which was about midday when the system should have been at peak production, the 4.6kW of solar photovoltaic panels here were producing about 5.2A which is approximately 187.2W, which is about enough electricity to run a few lightbulbs. My main source of energy at this time of year is actually firewood – which itself is a form of stored sunlight – and fortunately the firewood sheds are still absolutely full of the stuff. Those sheds have also become full of rats too which for some strange reason prefer the toasty dry conditions inside the shed to the outside world. Fortunately, Toothy willingly provides me with a hand and will happily hunt rats for hours if given the chance. And those are some of the many activities that go on each week in the background! Hope you enjoyed the tour. The temperature outside now at about 7.15pm is 6.7’C (44.0’F). So far this year there has been 400.6mm (15.8 inches) which is up from last week’s total of 350.8mm (13.8 inches). It can be very quiet here and the occasional tourist is quite an event. Most people are reasonably harmless and they simply travel slowly past the farm to enjoy the excellent view which looks down and across the valley below. Some people get out of their cars and enjoy the view from the road. It is a nice view after all. The most intrepid of tourists will even wave and smile to me as they speed past on their way to somewhere else. 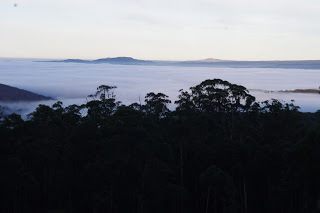 This view has even been quite useful on occasions and I recall that once the local fire brigade parked the fire truck up on the road above the house and used the view to spot a fire ignited by a lightning strike in a very tall tree in the thick forest down below. On Saturday afternoon however, I met an entirely different kind of tourist. The tourists were an older couple. 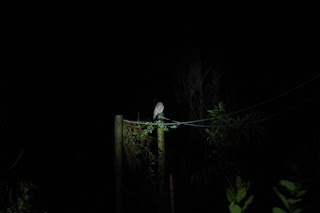 What made them unusual was that the female of the pair was lurking around in the forest up above the house. I rather suspect that the lady was going to the toilet in full view of my house. I can acknowledge that there are not a lot of public toilets up here in this mountain range, but still I believe that decorum is called for in such circumstances. The absolute cheek of them! 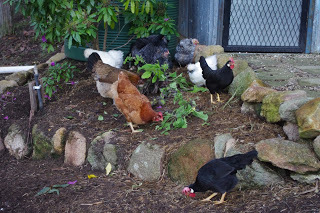 At the time of the strange couples visit, the editor and I were out with the chickens in the orchard enjoying a well-deserved coffee and Anzac biscuit (or two). It was very cold that day in the orchard. We heard the vehicle on the road rather than spotted it and when the engine stopped I had to skull down the coffee and consume my biscuit take away style. This left me in poor spirits but I stoically headed off to investigate the strange goings on. My first thought was that they were dumping rubbish in the forest. 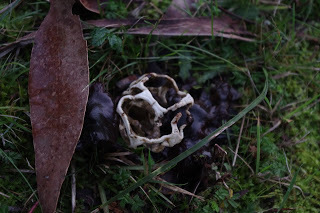 But no, the lady sheepishly walked out of the forest above my house and grabbed an expensive looking digital camera from the car and then started taking photos of the house, surrounds and the view. It was a surreal experience. The guy hadn’t even noticed my approach, and in fact I believe he was completely oblivious to my presence until I was close to him and said: What’s going on here? Incidentally, that is my pleasant approach for strangers doing strange things around these parts. The unpleasant approach goes along the lines of: Who are you and what are you doing here? The unpleasant approach is a reproach and it never fails to put people on the defensive. It is generally well deserved. On the other hand this older couple were just exhibiting strange behaviour. The couple were clearly not from the local area as their vehicle was quite clean – unlike most of the locals who at this time of year have a lot of mud and other assorted unidentified splats on their vehicles due to a combination of dirt roads and winter conditions. I also noted that they were wearing quite thin synthetic winter clothing, which is seriously inadequate for this cool climate. It was really cold that afternoon and I was wearing a woollen hat, jumper, alpaca scarf, sheepskin boots and my sheepskin jacket. Honestly, I must have looked a wild man stepping out of the forest to confront the two strange people who were doing strange things in the forest in full view of my house. Alas, everyone deserves a second chance, I guess, and whilst stuffing their bodies down a very deep wombat hole would have been an appropriate response, I decided after only a minute or so of talking with them, that they were basically clueless. I couldn’t believe it. Their story was that they were looking for a property to purchase in the area and I doubted that story until they produced a hand written list of properties for sale in the area. I suspect that they produced the camera from the car to cover up the fact that the lady had been using the land above my house as an open toilet. The couple seemed harmless enough but they did seem concerned and mildly baffled that living in a forest would leave them feeling hemmed in by the trees and they expressed the desire to purchase a house with a view where everything was “done” – whatever that means – and then apparently they could then happily live up here. At this point regular readers will recall that the list of projects that are still to be “done” here is quite extensive. It was all I could do to not burst out laughing at them as those requirements do not exist anywhere at all up this end of the mountain range! To stir the couple up a little bit I asked them how they would be prepared to deal with the sort of minor issues that are part of the day to day existence here. And that is when they said the strangest thing of all to me: “That would be hard. You have to be born in this sort of an area to know how to live here”. Now I’ve heard that trope from a lot of different people and it is patently not true. I gave the guy a searching look and said to him, “Mate. You have to learn how to learn”. Anyway, he looked very sceptical at that observation and after further conversation he and his lady departed. If I was a gambling man, I would take a bet that those two wouldn’t survive more than six months living up here. Certainly the first winter would be a shock to their pampered selves and they would quickly scurry back to the comforts of the city. I was earnest in that observation about having to: learn how to learn. Learning involves gaining or acquiring knowledge of or skill in (something) by study, experience, or being taught. That sounds simple enough, but it requires active participation, rather than mindless consumption. When we moved up to this property both the editor and I expressed a desire to learn something new every day, and an environment like this really lends itself to that. Did I mention how cold it has been this week? 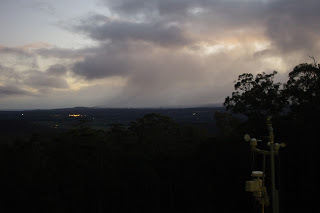 Just after sunset on Friday night, the air temperature outside was 0.5’C (32.9’F) and it sure felt cold to me. 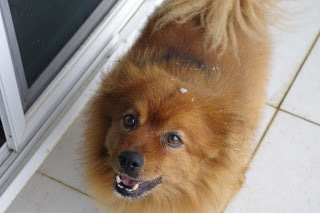 Even Poopy the Pomeranian (who is actually a Swedish Lapphund) and it must be said – has quite a thick coat, decided that the outside weather conditions were sub optimal! It really was cold that day as about an hour earlier a short lived snow storm rolled in across the valley. 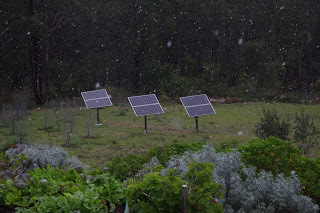 The solar photovoltaic panels appreciated the cold conditions as those increase their output, but then they struggled with the short lived snow storm and were producing no power at all! The fungi generally thrive where we have actively managed the invasive needle grass. I manage this grass by cutting it flat to the ground with my hand mower. Once the grass is on the ground and chopped up by the actions of the mower blades, the soil life begins to flourish and it rapidly consumes all of the available chopped up organic matter on the soil surface. The needle grass rarely returns. 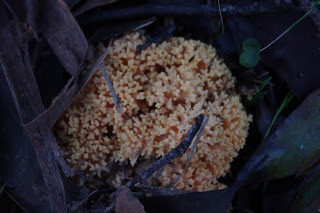 Nothing is ever that simple though and on some parts of the farm there are the remnants of the old logging days (which began in 1860) where the environment is so dry and damaged that the fungi can’t grow. 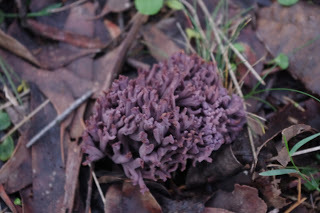 Today I, as a fun guy, was inspired by the fungi to tackle one of those logging waste areas. The main problem is that the loggers appear to have used bulldozers to drag stumps into various piles. The stumps are covered in clay by that process and because the clay sits above the ground it stays dry and preserves the timber which also stays dry. 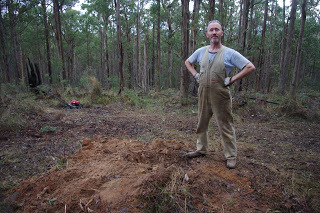 To tackle this logging waste area, I used a mattock to remove the clay from the stump which was partially buried in the ground. I then cut the stump into small manageable pieces. That is no easy job as the timber is very dirty and the chainsaw blunts very quickly because of all that clay. The timber is also very heavy and it displays scorch marks which would have been received during the last big fire here in January 1983. Eventually after many hours of hard work the job was done. 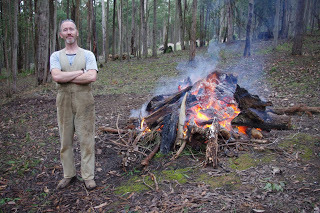 I generally burn off those stumps as the effort of cleaning the dirty timber, then cutting and splitting them into small pieces which will fit into my wood fire is too much for me. 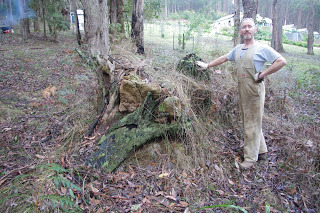 Now that the stumps have been removed and burned, I will smooth out the area, add some organic matter (chook poo) to the soil and then the fungi will move into that area! It was the week for tree stumps as we unfortunately discovered a very large tree stump at the top of the new concrete staircase which we have been building over the past few weeks. 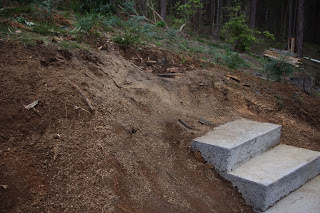 That stump had to be removed before we could continue building the concrete staircase. 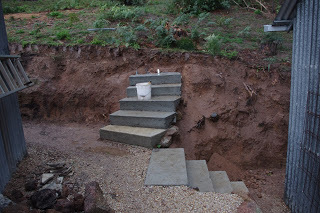 The excavations for the garden bed next to the new concrete steps were also completed this week. 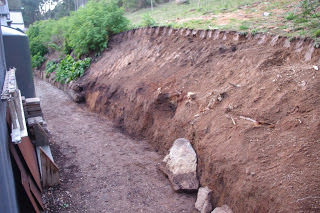 Observant readers will note in the photo below the many large rocks which will be used to retain the soil against the clay slope. 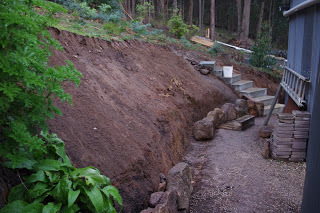 That rock wall still has 2m (7ft) of rocks to go before we can begin adding manure and plants in that new garden bed. 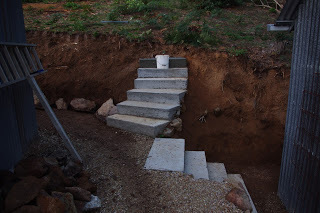 You will also notice in the photo below that there is also a new concrete step! There are still about four steps to go before the staircase is complete. Over the weekend the editor heard a strange whistle from the valley below which sounded like a steam train whistle. 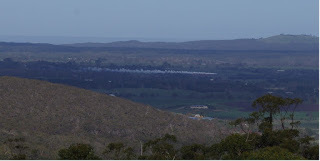 Sure enough there was a steam train running on the Bendigo line (the steam train usually resides further up the line at the town of Castlemaine) and we could clearly see the black locomotive and five red carriages trundling along what is normally a high speed commuter line. It was very pleasant sight to see! The temperature outside now at about 9.00pm is 4.3’C (39.7’F). 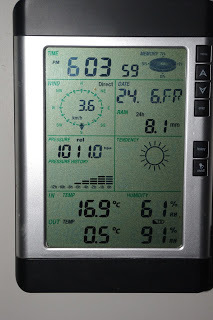 So far this year there has been 443.4mm (17.5 inches) which is up from last week’s total of 400.6mm (15.8 inches).